With the Premier, Premier Plus, Premier 55 and Premier Student checking accounts, you also receive a FREE myPic Studio™ Debit Card. 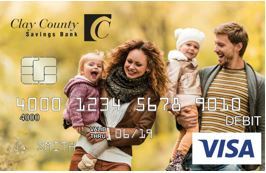 You can choose between three different card designs using a photo from our gallery, or upload your own photo to design a personalized myPic Studio Debit Card™. NOTE: If you upload a personal photo rather than choose one from the image gallery, you will receive an email advising whether your image was approved or denied. Your myPic Studio Debit Card order will be processed and shipped within 14 days. There are browser requirements to create a card at our secure third-party website, as well as image guidelines to meet for acceptance of your image, or you can choose an image from our gallery for your card. The myPic Studio Debit Card™ has a three-year expiration date, and your approved image will be stored for a period of at least three years. 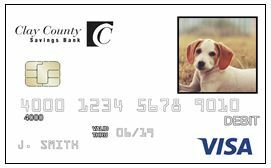 There is a $15 fee to replace a myPic Studio Debit Card™ other than at renewal, regardless of your checking account type. Click here to view the complete TERMS AND CONDITIONS for our myPic Studio Debit Card™. 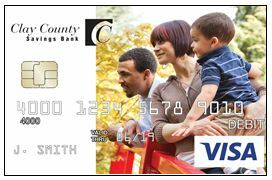 Any questions, please contact Clay County Savings Bank at (816) 628-4500.